Asparagus is one of the first vegetables ready to harvest in the spring and also one of the few perennial vegetables grown in the garden. Since it will be in the same spot for years, you really need to find a spot where it will have all the growing conditions it demands. Asparagus plants take three years to really fill in and mature, but it's worth the wait. Once they start hitting their stride, you will be harvesting asparagus spears for months every spring. The asparagus spears are straight young shoots of the plant, with scale-like tips. Later in the season, the foliage matures into an airy, fern-like cloud which changes to a golden color in the fall. Many people with space limitations use asparagus as a border or hedge plant. Since you won't be harvesting for the first year or so, asparagus requires some patience and preparation. Because asparagus is a perennial, you'll need to pick an out of the way spot in the vegetable garden, an area you can till around. Asparagus also needs space, about 4 to 5 feet for each plant. They won’t spread out much the first couple of years, but once established, they will quickly fill in. Keep the patch free of competing weeds. Get them while the asparagus plants are young. Asparagus roots form a tightly woven mat, from which no weed can be removed intact. The plants will need to be cut to the ground each year before new growth starts. You can do this in the spring or fall. Removing the dead foliage in the fall offers the advantage of preventing problems, like asparagus beetles, from over-wintering. However, some gardeners like to leave the foliage as a winter mulch. Asparagus does not have too many problems in the garden. Fusarium wilt can be a problem with older varieties, but you can avoid it by planting resistant varieties. The biggest pest is the asparagus beetle. Keep watch for them and hand pick the eggs when there are only a few. Otherwise, neem should keep them under control. Unblanched asparagus plants grow best in full sun. Without enough daily sunlight, you will wind up with thin spears and weak plants that are prone to problems. For a long-lived perennial like asparagus, it pays to take the time to improve your soil before you plant it. Work in plenty of organic matter and make sure the soil pH is in the neutral 6.0 to 7.0 range. Also get rid of any weeds and large stones in the area, before planting. Asparagus needs regular watering, especially while young. This is when the plants are gaining strength and becoming established. Give them a good start when you first plant them and you'll have fewer problems in future years. During the growing season, asparagus prefers a temperature of 70 to 85 degrees Fahrenheit during the day and 60 to 70 degrees at night. In the spring it will begin to grow shoots when the soil temperature reaches 50 degrees. Any frost after the shoots start growing will cause discoloration. You may see slow growth with temperatures above 85 or below 55 degrees. To keep the soil rich and help feed the asparagus plants, top dress the soil annually with compost or mulch. You can do this in early spring before the shoots appear, or in the fall after the fronds have died back and been cut to the ground. Asparagus is a heavy feeder and you should also give it a dose of fertilizer in mid-spring when it is actively growing. Plants can be started from seed about four weeks before the last expected frost. However, seeds will add several years to your wait. Most people find it easier to grow from crowns, which are readily available in the spring. They look like a worn out string mop, but they are very much alive. Unlike many plants, the roots of asparagus crowns can withstand some air exposure and you will usually find them for sale loose. They should still look firm and fresh, not withered or mushy and they should smell like asparagus. 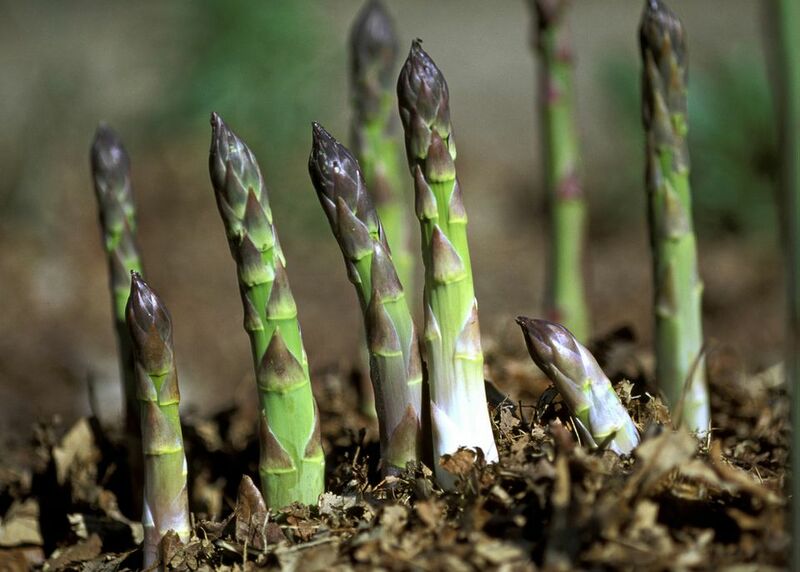 The most common way to plant asparagus crowns is in a trench. In the spring, dig a trench about 8 to 10 inches deep and 18 to 20 inches wide. Work in your compost or other organic matter at this time. To plant the crowns, spread the roots of the crowns out on the bottom of the trench. Space plants about 12 to 15 inches apart, so they will have room to grow. Cover with a couple of inches of soil and water well. As the plants begin to grow, continue covering them with soil, leaving only a few inches of the shoots exposed above ground. Do this until the trench is full. The newer cultivars are bred to be all male, which means they will put all their energy into growing spears, not setting seed. "Mary Washington" is the most commonly found variety. It was bred for rust resistance. "Jersey Giant" yields early and is resistant to rust and fusarium wilt. "Brock Imperial" offers high yields. "Princeville" does well in warmer climates. "Purple Passion" is a sweet purple variety. White asparagus is the same plant as green asparagus, however, it is blanched by preventing the spears from being exposed to light and therefore not allowed to photosynthesize. This is accomplished by covering the growing spears with either soil or plastic tunnels. The final product is smooth, white and virtually fiber free, provided the harvested spears are immediately chilled to prevent the fiber from forming. You can't really begin harvesting your asparagus spears until the third year after they are planted. They need that time to become established and build up their root systems. This is especially true the first year of planting when the shoots probably won't be very large. You can harvest a few spears in the second year of growth. The plants are not fully mature, so let them grow undisturbed after that initial harvest. In the third year, begin harvesting spears that are finger-sized and about 8 inches long. You can either snap off the spears or cut them with a knife, just below the soil line. If you use a knife, be careful you don't also slice the later shoots that are still underground and haven't yet poked through. Harvest for about four weeks in the third year. In subsequent years, the shoots will continue emerging from the soil throughout the spring. After you've been harvesting for a couple of months and the weather starts to warm, the shoots will begin to get spindly. At this point, allow the plants to grow into their mature ferny foliage, which will feed the roots for next year's crop. Asparagus plants can continue producing for 20 years or more.